Nicholas Thomas Swisher (born November 25, 1980) is an American former professional baseball outfielder and first baseman in Major League Baseball (MLB). He was a switch hitter who threw left-handed, and played for the Oakland Athletics, Chicago White Sox, New York Yankees, Cleveland Indians and Atlanta Braves. He won the 2009 World Series with the Yankees against the Philadelphia Phillies and was an All-Star in 2010. A power hitter with excellent plate discipline, Swisher hit at least 20 home runs in each of nine consecutive seasons from 2005 to 2013, and reached 75 bases on balls on seven occasions in that span. Swisher is the son of former MLB catcher Steve Swisher, who played for various National League baseball clubs in the 1970s and 1980s. Swisher was born in Columbus, Ohio, but grew up in Parkersburg, West Virginia. Before his professional career, Swisher played college baseball for the Ohio State Buckeyes. Drafted by the A's in the 2002 MLB draft, Swisher made his MLB debut with the Athletics in 2004, and played for the team through 2007. After he spent one year with the White Sox in 2008, the Yankees acquired him prior to the start of the 2009 campaign. He played in New York for four years before signing with the Cleveland Indians prior to the 2013 season. Swisher was born in Columbus, Ohio, the son of Lillian Marie (Vaught) Malizia and Steve Swisher, a former major leaguer. His mother was of part Italian descent; her grandfather immigrated to the Buffalo area from the town of Oliveri, in Sicily. Swisher's parents divorced when he was 11 years old. He then went to live with his grandparents in Parkersburg, West Virginia, who raised him during his teenage years. Swisher was a two-sport star at Parkersburg High School in football and baseball, as well as a letterman in basketball. As a strong safety he was recruited by several Division I-A football programs, including University of Notre Dame, but chose to pursue baseball. Undrafted in the Major League Baseball Draft out of high school, Swisher enrolled at Ohio State University, as that school and Ohio University were the only colleges to recruit him for baseball. Playing for the Ohio State Buckeyes baseball team in the Big Ten Conference, Swisher was named Big Ten Freshman of the Year in 2000, after hitting .299 with 10 home runs and 48 runs batted in (RBI). He was an All-Big Ten selection as a first baseman as a sophomore in 2001, after hitting .322 with 56 RBI and a league-leading 15 home runs. He earned All-Big Ten honors as an outfielder in 2002, after batting .348 with 10 home runs and 52 RBI. Swisher was selected by the Oakland Athletics with a first round pick they received from the Boston Red Sox in 2002 as compensation for the signing of free agent Johnny Damon by the Red Sox. Swisher, and the Athletics' 2002 draft, are heavily featured in Michael Lewis' 2003 book Moneyball. In a book whose key theme is the gulf between orthodox baseball thinking and the new sabermetric-influenced system being implemented by Billy Beane, Swisher was notable as one of the few examples of a player who traditional scouts and Beane could agree upon. Swisher made his professional debut with the Vancouver Canadians of the Class A-Short Season Northwest League in 2002, before he was promoted to the Visalia Oaks of the Class A-Advanced California League. Swisher started the 2003 season with the Modesto A's, Oakland's new California League affiliate, where he batted .296 in 51 games before receiving a promotion to the Midland RockHounds of the Class AA Texas League in June. He batted .230 in 76 games for Midland to finish the season, and then played in the Arizona Fall League for the Mesa Desert Dogs. Swisher played for the Sacramento River Cats of the Class AAA Pacific Coast League for the 2004 season. That season, he led all minor league baseball players with 103 walks. Swisher made his MLB debut in 2004 for the Athletics, playing in 20 games. 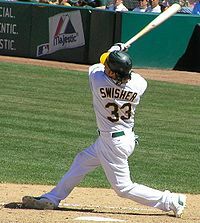 Retaining his rookie status for 2005,[a] Swisher hit 21 home runs and recorded 74 RBI in 131 games for the 2005 Athletics. He finished 6th in the American League Rookie of the Year voting. Teammate Huston Street won the award, while fellow 2002 Oakland draftee Joe Blanton finished seventh. Following his rookie season, Swisher improved in most offensive categories. During the 2006 regular season, Swisher compiled a .254 batting average with 35 home runs. He also improved his on-base percentage by raising it to .372, as well as boosting his slugging percentage to .493. Swisher finished second for the team in on-base plus slugging behind the veteran slugger Frank Thomas. Swisher spent about half of his playing time in left field, and the other half at first base. The Oakland A's lacked both Dan Johnson and Erubiel Durazo for a large portion of the 2006 season, leaving room for Swisher to move back into his preferred position on a temporary basis. During the season, Swisher wrote a column for ESPN.com about his various baseball experiences called Sophomore Year. This included multiple articles that pertained to his early MLB playing experiences, as well as the MLB Draft of 2002. Swisher made his postseason debut as the Oakland A's took on the Minnesota Twins in the 2006 ALDS. Swisher got 3 hits and an RBI during the series as the Oakland A's performed a 3-game sweep against the Twins to advance to the ALCS. During the 2006 ALCS vs the Detroit Tigers, Swisher had a .100 batting average with one hit. The Oakland A's would eventually lose the ALCS to the Tigers in just 4 games. On September 16, 2007, Swisher initiated a brawl when he charged the mound after getting hit by a pitch from Texas Rangers pitcher Vicente Padilla. Earlier in the plate appearance, Padilla (who had hit Swisher the prior year) threw two inside pitches with the apparent intention of hitting Swisher. Both players were ejected following the brawl, and Swisher received a three-game suspension. Swisher was traded on January 3, 2008 to the Chicago White Sox for minor leaguers Ryan Sweeney, Gio González, and Fautino de los Santos as part of what Athletics general manager Billy Beane termed a "rebuilding effort". While Swisher quickly established himself as a fan favorite on his new team he struggled offensively, batting just .219 through the season (the lowest batting average in the majors), though he improved his home run total from 22 in 2007 to 24 in 2008. He also led the majors in pitches per plate appearance, with 4.51. Because of his poor offensive play White Sox manager Ozzie Guillén benched Swisher for most of September, saying publicly that "I have to put the best lineup out there to win the game ... To me, the best lineup right now is without (Swisher)." Swisher finished the 2008 regular season with a .219 batting average, 24 home runs, and 69 RBI. Despite his career low stats in the regular season, Swisher was included in the postseason roster for the White Sox. During the 2008 ALDS against the Tampa Bay Rays, Swisher had a hit and 2 walks. The White Sox would eventually lose the division series against the Rays in 4 games. On November 13, 2008, Swisher and minor league pitcher Kanekoa Texeira were traded to the New York Yankees for utility man Wilson Betemit and minor league pitchers Jeffrey Marquez and Jhonny Núñez. Swisher was acquired to be the Yankees starting first baseman. However, the Yankees signed Mark Teixeira later in the offseason, who took the starting role. At the end of spring training, manager Joe Girardi announced that Xavier Nady would be starting in right field while Swisher would be a bench player. Due to the perceived logjam, many teams reportedly pursued Swisher, but the Yankees opted to keep him as a reserve outfielder and first baseman. On April 9, 2009, in a game against the Baltimore Orioles, Swisher started for the first time as a Yankee in right field, replacing Xavier Nady who was playing DH to give Hideki Matsui a rest. Swisher went 3-for-5 with a home run and tying his career high of five RBIs. Just five days later, Swisher became the starting right fielder after Nady went on the disabled list due to an elbow injury. On April 13, 2009, in a game against the Tampa Bay Rays, Swisher pitched one inning in relief, allowing one hit and one walk before retiring the next three batters in a row, including a strikeout against Gabe Kapler in his first pitching appearance in the major leagues. He was the first Yankee position player to pitch since Wade Boggs in 1997 and the first Yankee to homer and pitch in the same game since Lindy McDaniel did it in Detroit on September 28, 1972. Swisher hit his first postseason home run in the 2009 World Series. He got his only championship title as the Yankees eventually won the World Series against the Philadelphia Phillies in 6 games. Due to a .128 batting average in the 2009 postseason, Swisher worked with hitting coach Kevin Long to reinvent his swing for the 2010 season. Swisher was a contestant in the 2010 All-Star Final Vote from July 4 to 8. Swisher lobbied for the post with a promotion commercial of him with a surf board to indicate that he would be surfing in Southern California since the game was to be hosted by the Los Angeles Angels of Anaheim. In what was to that date the closest vote in Final Vote history, he won the final place on the AL roster ahead of Red Sox first baseman Kevin Youkilis. Additionally, Swisher participated in the Home Run Derby. Swisher finished the season with a career-high .288 batting average and 29 home runs. Although Swisher was usually hitting in the bottom third of the lineup, he was moved into the #2 slot in the lineup after Nick Johnson went down with an injury and served as a buffer for the middle of the Yankees lineup. In 2011, Swisher was moved down in the lineup to allow Curtis Granderson to hit second behind Derek Jeter and spent the majority of the season hitting sixth behind Robinson Canó. His fielding percentage ranked 2nd among all American League Right Fielders with a .996 behind Baltimore's Nick Markakis. Although Swisher's totals dipped a bit from his 2010 career year, he still managed to hit .260 and was one of four Yankees with at least 20 home runs (after Granderson, Teixeira, and Cano) and finished fourth on the team with 85 RBIs. On November 9, 2012, Swisher declined a $13.3 million one-year qualifying offer from the Yankees, making him a free agent. Under the new collective bargaining agreement, the Yankees received a compensatory pick because the Indians signed Swisher but it was not the Indians' pick. Cleveland, in turn, surrendered its highest pick outside of the top ten but that pick did not go to the Yankees, it was just skipped in the draft. On December 23, 2012, Swisher agreed to a four-year, $56 million contract with the Cleveland Indians. The contract reportedly included a fifth year vesting option worth $14 million, making the total contract worth $70 million. The deal became official on January 3, 2013. He soon called a section of the stadium Brohio. The Yankees received a compensation draft pick for the 2013 MLB draft as a result of losing Swisher, subsequently using it on Aaron Judge. The 2014 season marked a difficult one for Swisher, as injuries had caused him to post career lows in batting average (.208), games played (97) and home runs (8). On June 19, 2014, after going 0–4 at the plate with three strike outs, and with two outs and two strikes, Swisher hit a walk-off grand slam against the Los Angeles Angels of Anaheim propelling the Indians to a 5–3 win in ten innings. On August 20, the Indians announced that Swisher would have arthroscopic surgery on both of his knees, ending his season. Swisher began the 2015 season on the 15-day disabled list due to still recovering from surgery on both knees. On May 5, Swisher was activated from the disabled list and played almost exclusively at DH for Cleveland before he was placed on the 15-day disabled list with left knee inflammation on June 14. On August 7, 2015, the Indians traded Swisher and Michael Bourn with cash considerations to the Atlanta Braves for Chris Johnson. Swisher batted .195 in 46 games for the Braves. On March 28, 2016, the Braves released Swisher, despite owing him $15 million for the 2016 season. On April 14, 2016, Swisher signed a minor league contract to return to the Yankees. They assigned him to the Scranton/Wilkes-Barre RailRiders of the Class AAA International League. Playing first base, Swisher batted .255 with seven home runs and 25 RBIs in 55 games. The Yankees opted not to promote Swisher to the major leagues, in spite of injuries suffered by Mark Teixeira, Dustin Ackley, and Chris Parmelee. On July 2, Swisher opted out of his contract to be with his family following the birth of his second daughter. He announced his retirement on February 17, 2017, and became an analyst for Fox. Swisher's father, Steve Swisher, played 509 games in the major leagues with the Chicago Cubs, St. Louis Cardinals, and San Diego Padres from 1974 through 1982. Swisher was very close to his paternal grandmother, Betty Lorraine Swisher, who raised him after his parents' divorce. She died from brain cancer in 2005, and he has a memorial tattoo in her honor on his chest (her initials, surrounded by angel's wings and a halo.) Swisher routinely looks up to the sky to honor his parents and grandparents. He also touches his lips and points to the sky in his grandmother's honor after he gets a hit as well as inking her initials on the bottom of his bats' knobs and kissing the letters when he comes to home plate. To honor her further, he let his hair grow for eleven months and donated it to Pantene Beautiful Lengths, a program that creates free wigs for cancer patients. On May 19, 2007, he cut his hair with assistance from his father. His website, nickswisher.net, is also dedicated to his grandmother. After his grandfather, Don, died in November 2008, Swisher began adding his initials to his bats as well. He later stated that he planned on getting another tattoo on his back in the same style as his existing one after the 2009 season to honor his grandfather. In August 2009, People reported that Swisher was dating actress JoAnna Garcia. Swisher and García became engaged in May 2010, and married on December 11, 2010, at the Breakers Hotel & Resort in Palm Beach, Florida. The couple have two daughters, born May 2013 and June 2016. In 2011, Swisher guest starred as himself on two episodes of his wife's sitcom, Better with You. The first episode aired February 16 and the second aired February 23. He also appeared in the episode "Perfect Week" of How I Met Your Mother, which aired in February 2010. Swisher released a children's music album titled "Believe" on August 9, 2011. A percentage of the proceeds was to be donated to "Swish's Wishes", a charity started by Swisher for children who are facing health crises. The 12-song album features guest appearances from Bernie Williams and Barry Zito. All of the songs recorded on the album are cover songs that were selected by Swisher. The album peaked at #3 on the chart of iTunes Children's Albums. ^ Though Swisher debuted with the Athletics in 2004, he qualified as a rookie in 2005, as he had less than 130 at-bats during the 2004 season. ^ "Lillian Malizia Obituary". The Columbus Dispatch. Archived from the original on April 25, 2016. Retrieved April 18, 2016. ^ "Passenger Search". Retrieved April 18, 2016. ^ a b c d McCarron, Anthony (May 9, 2009). "Swisher Honors Memory of Woman Who Raised Him". New York Daily News. Archived from the original on May 14, 2009. ^ a b "Nick Swisher Has Found Success In His Strut". Sports Illustrated. May 29, 2006. Archived from the original on February 11, 2009. Retrieved November 19, 2009. ^ Times. "Nick Swisher". The Baseball Cube. Retrieved August 9, 2015. ^ Lewis, Michael (2003). Moneyball: The Art of Winning an Unfair Game. W.W. Norton & Company Inc. ISBN 0-393-05765-8. ^ Times (June 21, 2002). "Spokesman.com | Archives". Nl.newsbank.com. Archived from the original on September 7, 2014. Retrieved December 23, 2012. ^ "Visalia Alumni in MLB All-Star Game | Visalia Rawhide News". Milb.com. Archived from the original on September 7, 2014. Retrieved December 23, 2012. ^ "NL.Newsbank.com". Retrieved September 7, 2014. ^ . "Talking baseball with Swisher | MLB.com: News". Mlb.mlb.com. Retrieved December 23, 2012. ^ "2004 Minor League Batting Leaders". Baseball-Reference.com. Archived from the original on April 24, 2013. Retrieved December 23, 2012. ^ "MLB Miscellany: Rules, regulations and statistics". MLB Advanced Media. Archived from the original on August 3, 2008. Retrieved June 5, 2012. ^ "Street wins AL Rookie of Year; Howard wins NL". ESPN.com. Archived from the original on February 14, 2009. Retrieved April 18, 2016. ^ "A season in the life of Nick Swisher". ESPN.com. Archived from the original on August 10, 2014. Retrieved April 18, 2016. ^ "Padilla appeals suspension; Swisher to serve three games". ESPN.com. September 18, 2007. Retrieved May 28, 2018. ^ Rebuilding A's continue dealing – Swisher to White Sox Archived February 14, 2009, at the Wayback Machine MLB.com. Retrieved January 3, 2008. ^ "2008 Major League Baseball Advanced Batting". Baseball-Reference.com. Archived from the original on August 31, 2009. Retrieved June 2, 2010. ^ "2008 Major League Baseball Pitches Batting". Baseball-Reference.com. Archived from the original on August 31, 2009. Retrieved June 2, 2010. 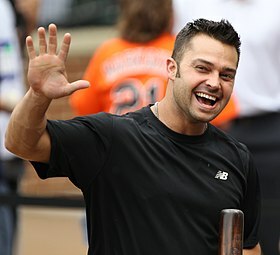 ^ Ex-Buckeye Nick Swisher Is Becoming a Fan Favorite. Archived May 4, 2009, at the Wayback Machine. Bleacher Report (October 22, 2010). Retrieved on 2010-12-22. ^ "Yankees acquire 1B/OF Nick Swisher and Kanekoa Texeira from the Chicago White Sox in exchange for INF Wilson Betemit and two Minor League pitchers, 11/13/2008" (Press release). Major League Baseball. November 13, 2008. Archived from the original on February 12, 2009. Retrieved July 22, 2011. ^ Hoch, Bryan (December 23, 2008). "Yanks feel fortunate to land Teixeira: Move delivers a convincing warning to the American League East". MLB.com. Archived from the original on January 11, 2009. Retrieved June 1, 2010. ^ Kepner, Tyler (March 23, 2009). "Yankees' Right-Field Competition Ends With Nady as the Winner". New York Times. Archived from the original on May 4, 2018. Retrieved June 1, 2010. ^ Haft, Chris (January 8, 2009). "Giants, Swisher would be nice match: Yankees could be shopping outfielder after signing Teixeira". MLB.com. Archived from the original on January 22, 2009. Retrieved June 1, 2010. ^ Kepner, Tyler (January 16, 2009). "Yankees Hearing Offers for Swisher and Nady". New York Times. Archived from the original on May 4, 2018. Retrieved June 1, 2010. ^ Feinsand, Mark (April 15, 2010). "Yankees OF Xavier Nady headed to disabled list, could be done for season". New York Daily News. Archived from the original on April 18, 2009. Retrieved June 1, 2010. ^ "MLB – New York Yankees/Tampa Bay Rays Box Score Monday April 13, 2009 – Yahoo! Sports". Sports.yahoo.com. April 13, 2009. Archived from the original on October 21, 2012. Retrieved June 2, 2010. ^ "New York Yankees vs. Tampa Bay Rays – Preview – April 14, 2009 – ESPN". Sports.espn.go.com. April 14, 2009. Archived from the original on April 17, 2009. Retrieved June 2, 2010. ^ Nick Swisher's offense is now in full swing Archived July 14, 2010, at the Wayback Machine. NorthJersey.com. Retrieved on December 22, 2010. ^ Newman, Mark (July 8, 2010). "Votto, Swisher win tight Final Vote". MLB.com. Archived from the original on July 11, 2010. Retrieved July 8, 2010. ^ "Nick Swisher Statistics and History". Baseball-Reference.com. Archived from the original on August 8, 2011. Retrieved July 22, 2011. ^ Boland, Erik (November 9, 2012). "Nick Swisher, Rafael Soriano and Hiroki Kuroda decline Yankees' qualifying offers". Newsday. Archived from the original on November 15, 2012. Retrieved November 10, 2012. ^ "Indians, Nick Swisher agree to deal". December 23, 2012. Archived from the original on December 23, 2012. Retrieved December 23, 2012. ^ "Aaron Judge is making a powerful impression on the Yankees". foxsports.com. May 4, 2017. Archived from the original on October 19, 2017. Retrieved May 4, 2018. ^ "Nick Swisher says he's going through "uncharted waters' this season with Cleveland Indians". June 30, 2014. Archived from the original on July 14, 2014. Retrieved July 10, 2014. ^ Jason Lukehart (June 14, 2015). "Indians place Nick Swisher on DL with left knee inflammation, or maybe Giambitis". Let's Go Tribe. Archived from the original on April 27, 2016. Retrieved April 18, 2016. ^ "Indians trade Nick Swisher, Michael Bourn to Atlanta Braves". fox8.com. Archived from the original on April 12, 2016. Retrieved April 18, 2016. ^ "Atlanta Braves release former Cleveland Indian Nick Swisher, who is still owed $15 million". cleveland.com. Archived from the original on April 19, 2016. Retrieved April 18, 2016. ^ "Braves release Nick Swisher". FOX Sports. March 28, 2016. Archived from the original on April 10, 2016. Retrieved March 28, 2016. ^ Feinsand, Mark (April 13, 2016). "Nick Swisher signs minor-league deal with Yankees". New York Daily News. Archived from the original on June 14, 2016. Retrieved July 2, 2016. ^ Feinsand, Mark (July 2, 2016). "Family first as Nick Swisher opts out of his Yankees minor-league deal, not ruling out a return next season". New York Daily News. Archived from the original on July 5, 2016. Retrieved July 2, 2016. ^ Perry, Dayn (February 17, 2017). "Former Yankee Nick Swisher announces his retirement after 12-year career". CBSSports.com. Archived from the original on February 18, 2017. Retrieved February 18, 2017. ^ "BaseballReference.com". Archived from the original on October 14, 2014. Retrieved September 7, 2014. ^ "nickswisher.net". "nickswisher.net". Archived from the original on July 23, 2011. Retrieved July 22, 2011. ^ Marx, Linda (August 12, 2009). "Is Kate Hudson A-Rod's Good Luck Charm? – Couples, Alex Rodriguez, Kate Hudson". People.com. Archived from the original on January 8, 2011. Retrieved June 2, 2010. ^ "Privileged's Joanna Garcia and Yankee Nick Swisher Are Engaged". People. May 28, 2010. Archived from the original on December 6, 2010. Retrieved December 12, 2010. ^ "Joanna Garcia and Nick Swisher Wed in Palm Beach". People. December 11, 2010. Archived from the original on September 30, 2012. Retrieved December 12, 2010. ^ "Nick and JoAnna Garcia Swisher Welcome a Daughter". People. May 22, 2013. Archived from the original on July 3, 2016. Retrieved May 22, 2013. ^ "Nick and JoAnna Garcia Swisher Welcome Daughter Emerson Jay". People. Archived from the original on July 3, 2016. Retrieved May 23, 2013. ^ "Nick and JoAnna Garcia Swisher Welcome Daughter Sailor Stevie". People. July 1, 2016. Archived from the original on July 2, 2016. Retrieved July 3, 2016. ^ "Video: Does JoAnna Garcia's NY Yankee Husband Hit a Home Run on Better With You?". TVLine.com. February 13, 2011. Archived from the original on February 18, 2011. Retrieved February 19, 2011. ^ Snyder, Whitney (February 17, 2010). "Nick Swisher On 'How I Met Your Mother' (VIDEO)". Huffingtonpost.com. Archived from the original on February 5, 2010. Retrieved June 2, 2010. ^ "'Believe' It: Yankees Slugger Nick Swisher Releases Children's Album". Associated Press. August 4, 2011. Archived from the original on September 25, 2015. Retrieved August 9, 2015. 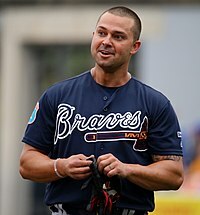 Wikimedia Commons has media related to Nick Swisher.